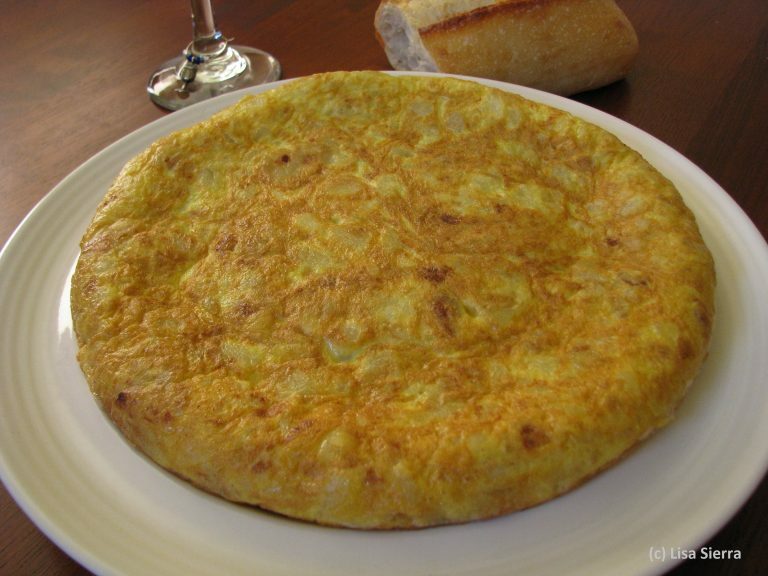 Is the tortilla de patata (Spanish omelet) the national dish of Spain? It might be. The Spanish eat it as a tapa, for light dinners or any time of day! We prepare a tortilla every Thursday night. We add a baguette, slices of Manchego cheese and Spanish chorizo, as well as a bottle of wine, and dinner is ready! Tortilla de patata is a potato omelet in Spain. The Spanish eat it any time of the day, but it is most commonly eaten as a tapa in bars. Chop potatoes and onions, then fry. Mix with beaten eggs and cook in a frying pan, and you are ready to eat! Peel the potatoes, then cut in half lengthwise. Then, with the flat side on the cutting surface, slice the potato in pieces approximately ⅛-inch thick. If the slices are thinner, they will get crispy when fried. If the slices are much thicker, they will take longer to cook. It takes practice to slice the potatoes uniformly. Peel and chop the onion into pieces about ¼-inch square. Put sliced potatoes and onions into a bowl and mix them together. Salt the mixture. In a large, heavy, non-stick frying pan, heat the olive oil on medium high heat. Drop a single piece of potato into the oil to ensure it is hot enough to fry. Place the potato-onion mixture into the frying pan, spreading evenly over the surface. The oil should almost cover the potatoes. Note: If the oil is too hot, the potatoes will brown rapidly on the outside, but still be raw on the inside. Poke a piece of potato with a spatula, and if it easily breaks in two, the potatoes are done. Remove from the pan with a slotted spoon or spatula. Now cook the omelet. Pour 1-2 Tbsp olive oil into a small non-stick frying pan (aprox. 9-inch) and heat on medium. When hot, stir the potato onion mixture once more and “pour” into the pan and spread out evenly. Allow the egg to cook around the edges. Then, carefully lift up one side of the omelet to check if the egg has slightly “browned.” The inside of the mixture should not be cooked and the egg should be runny. Once omelet is brown on bottom, it’s time to turn it over to cook the other side. Take the pan to a sink. Place a large dinner plate (12”) upside down over the frying pan. With one hand on the frying pan handle and the other on top of the plate to hold it steady, quickly turn the frying pan over and the omelet will “fall” onto the plate. Place the frying pan back on the range and put just enough oil to cover the bottom and sides of the pan. Let the pan warm for 30 seconds or so. Now slide the omelet (which is probably still a bit runny), into the frying pan, using a spatula to catch any egg mixture that runs out. Use the spatula to shape the sides of the omelet. Let the omelet cook for 3-4 minutes. Turn the heat off and let the tortilla sit in the pan for 2 minutes. Carefully slide the omelet onto a plate! To serve as a main course, slice it into 6-8 pieces like a pie. Serve sliced French bread on the side. If you are serving as an appetizer, slice a baguette into pieces about ½ inch think. Cut the tortilla into squares about 1.5” and place a piece on top of each slice of bread. TIP: Place the potato and onion mixture in a colander for a few minutes to allow more oil to drain. If you do this, place a plate underneath to catch the olive oil and you can use it again.